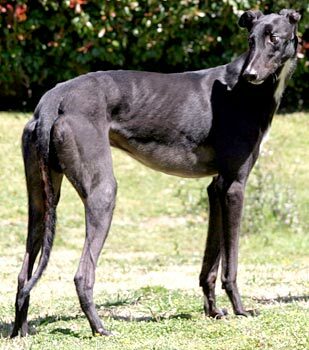 Pepper, aka Giddy’s Buzz, is a 2½-year-old black male born December 28, 2006. His sire is the Irish bred Larking About and his dam is Giddy Pepper. 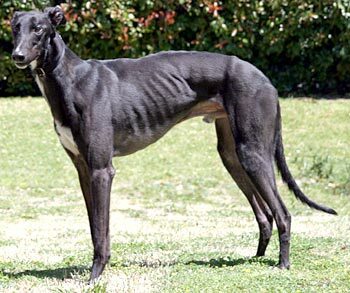 Giddy’s 24 race career started August 17, 2008, at Dubuque, Iowa, moving to Valley Race Park in Harlingen, Texas, and ended January 31, 2009, with a fractured right central tarsal bone. Pepper was transported to Dallas on Monday, February 2, and surgery was performed the next day at Dallas Veterinary Surgery Center by Dr. Robert Barstad. Pepper’s leg is healed now, and his medical procedures are completed. 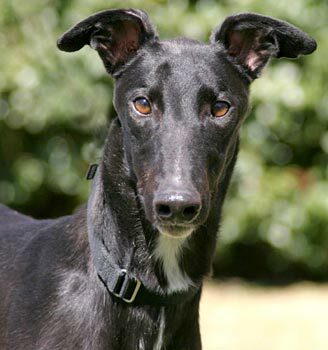 Pepper is on the search for his forever home! Pepper is not cat tolerant. We will test him with small dogs at a later time. There couldn't possibly be a sweeter boy out there than Pepper - he loves his people! After having Pepper for about 4 months, he is just now prying himself away from the humans to try playing with the other dogs. Most of the time he couldn't care less about the other dogs, but every so often he initiates play with our canine youngster. 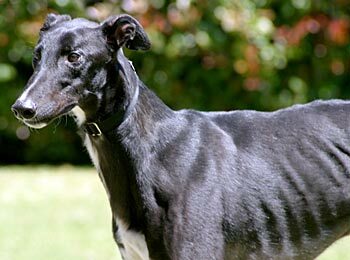 Pepper seems to be much more content lounging around, what most retired Greyhounds do best. Pepper has yet to have one potty accident in the house, despite being confined to an x-pen for 2 months while he recovered from surgery for a broken leg. He goes to the back door every time he needs to potty and is crated for up to 6 hours a day with no problem. Pepper walks well on a leash, and seems to be a perfect gentleman when in public. This boy sure does love his meals - you won't find him missing a morsel of his food! Pepper gets along well with male and female dogs alike, but we have yet to test him with small dogs.